Misconceptions about fostering can deter would-be foster carers from coming forward, suggests a poll. Some 10% of adults surveyed for Action for Children did not know fostering meant providing temporary care, confusing it with adoption. And a large proportion believed those aged above 55, gay people, and men were barred from becoming foster carers. “There is an urgent need to tackle these misconceptions,” said Darren Johnson, of Action for Children. 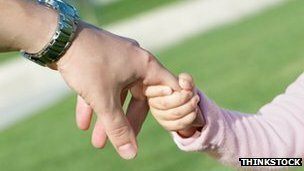 Figures produced by another fostering organisation have suggested at least 9,000 new foster families will be needed in the UK by the end of the 2013 to cope with record numbers of children in care. The Fostering Network says there are now a record 61,700 children in foster care and with 13% of foster carers leaving the service each year there is an urgent need to recruit. The Action for Children survey asked more than 2,000 adults about their attitudes to fostering. One in three believed wrongly that you could not foster if you lived in rented accommodation. A similar number were unaware that foster carers received financial support and wrongly thought they would be barred from foster care if they were not in full-time employment. Many people also thought certain groups were barred from fostering – with 54% thinking over-55s were excluded; 16% that men could not foster and one in three that gay people would not be accepted. An overwhelming proportion of those surveyed (96%) were unaware of the numbers in care in the UK – some 91,000 children. The charity has launched a myth-busting guide to fostering, hoping to encourage more people to provide temporary homes to children with family problems. Mr Johnson said fear of rejection often led to delays in would-be foster carers volunteering themselves. He added: “With myths preventing people from coming forward and the public not knowing the true extent of just how many children are currently in care, we are on course for a crisis. Jackie Sanders, of the Fostering Network, said: “Fostering services face a big challenge every year, recruiting thousands of foster carers to replace those who leave and to provide homes for growing numbers of children coming into care. “A wide pool of carers is needed to help fostering services find the right foster home for every child, first time. “It’s important to bust myths about who can apply to foster, but it’s just as important to outline the skills that foster carers need, and to be clear about where there are current gaps. A DfE spokesman said: “Foster carers are the unsung heroes of the care system. They make an invaluable difference to vulnerable children – offering them routine, stability and loving homes.